The storyline fandom was crushed when it was finally announced that the novel line was dead. Behind the scenes, people at Wizards of the Coast weren't happy either. Doug Beyer described the lack of a story for Innistrad as "heartbreaking." Brady Dommermuth (who himself would abruptly leave WotC just a year later) clearly seemed frustrated with the turn of events. Both in the company and in the fandom, it seemed clear: some portion of people really wanted there to be a storyline of some sort. The next six years would see a series of experiments in making that possible again . . . There's a lot of similarities between Innistrad and Mirage. Both are masterpiece blocks, beautiful mechanical and flavorful designs. Both had the misfortune of falling in interstitial periods where no new material was being published. The creative team for Innistrad was, from what I understand, caught off guard by this. Innistrad clearly had a worked out narrative, though it was one we saw only in bits and pieces. There's no way to talk about this without addressing the double edged nature of this. What we got, in worldbuilding, in supplementary stories, in the letters and notes written in the voices of various characters on the plane (like fan favorites Gisa and Geralf) was incredible. Maybe the novel for this block would've been on par with Quest for Karn. Maybe not. What emerged from the strange chaos of that period, a period when suddenly the novel line that defined Magic's flavor for so long vanished and everyone was left to stumble around in the resultant darkness for a year, was still something remarkable.
. . . Ok, ok, I admit, comparing the novel line's place in our lives to the sudden departure of the angel Avacyn is a bit of a stretch. It sure felt like a loss at the time! That's all I'm saying! And like Avacyn's absence, while that storyline-less year felt like it might last forever, we weren't to be left without a written story for long. Spoiler alert: ebooks could not save the novel line, not in terms of a line of books that fans would purchase anyway. They might just have saved the storyline, though. This was still a pretty interesting period, even though it only lasted two blocks. Return to Ravnica and Theros were the first blocks released after the reordering of the Magic story status quo, and, prompted by Doug Beyer's pushing internally, each got an ebook (of which Beyer wrote the pilot example). These were short digital productions released in bite sized chunks through Your Internet Retailer Of Choice. You still had to pay for the storyline, but you didn't, in theory, have to worry about finding a physical copy of the books, and each installment was just a few dollars. These sets also represented a slow but measurable shift in the story vs card dynamics that changed so drastically after Weatherlight. It took over a decade for WotC to get over its collective terror at the thought of representing the story more substantively on the cards, but get over it they (slowly) did. These sets, expanding on a trend that was already emerging in Innistrad, had many more references to the actual proposed plotline of the block, with central characters Jace and Elspeth making some solid appearances in card art and in flavor text. We also got some side stories on the cards, and on the Magic home page, featuring characters like Gideon. This all seems to have been part of a push to get people more familiar with and aware of Magic's storyline, something that the game has long struggled with. Magic's story has always suffered from whisper down the alley effects as players pick up the story third or fourth hand at their local game stores, or old lore got passed around from questionable sources. (Infamously "Guybrush Threepwood" for years was considered a canonical pre-revisionist Planeswalker in some databases because someone added his name to a list as a joke and no one else noticed.) WotC started pushing back against that around this time by commissioning specific art not for cards but just to prove that yes, things like Elspeth getting killed by Helios were, in fact, canon. A year after it seemed like the novel line was gone for good, there were actual novels again, albeit virtual ones. It's true that the ebooks couldn't save the novel line in the sense of maintaining a for-purchase set of stories, it did save the novel line in the sense that it kept the storyline moving just long enough to make Magic Story viable. Part of this success came from the greater accessibility of these books. Unrestricted by print, and divided into pieces that allowed for smaller impulse purchases, the ebooks offered players a far lower barrier to entry. This was also paired with a greater push to actually market the damn books. Previously, advertising for the books was pretty patchy. The block and Planeswalker novels got some coverage, but, shockingly and bewilderingly, the Artifacts Cycle Omnibus Editions — really slick looking collections of the whole backstory of Urza and the Thran — got barely any attention, even on Magic's article homepage. Apparently the original Mirrodin cycle was released around the time of Scars of Mirrodin as ebooks, starting a tradition that continues today . . . but I didn't realize it till literally yesterday. My sense of “The Secretist” and “Godsend”, though, was that the books actually received a solid push, at least online, to make players aware that they existed and could be purchased. It's hard for me to say from the outside whether this strategy worked . . . but the fact that we have Magic Story today suggests to me that players were taking notice of the storyline in some capacity. And the stories were not perfect, but generally pretty solid genre fare. Both seem to have been generally positively received by the fandom, and the fact that both offered climactic events for two well known, popular characters — Jace's ascent to the Living Guildpact, and Elspeth's ascent to being a god's emissary (and then descent to being dead) — made ripples in the wider fandom. These events demonstrated to Wizards, I suspect, that players could be invited to invest their attention in the game through the storyline . . . but that the company had to make special efforts (through specifically commissioned art and the communication of major events on the cards) to make sure that storyline was understood. The ebooks were ok, and the sales were similarly "not amazing, but ok," but the business model was a little weird. The price of ”The Secretist”, the book accompanying Return to Ravnica, added up to about the same price as a paperback, without being, you know, a physical object that you own, rather than a digital one that you rent. Maybe I'm a fuddy duddy for being bothered by that, but this is my column and I can be a fuddy duddy if I wish. Anyway, despite being digital entities, for some never explained reason the books simply weren't available to readers in various areas globally. Written in house by Doug Beyer and Jenna Helland, these novels were produced at a time when the creative team was of pretty reduced size, written in between the other duties of these team members. I imagine this constraint is what Doug Beyer is referring to in a recent blog post where he says the ebooks "were cost-effective but the work was unsustainable." “The Secretist” in particular suffers somewhat from size constraints — that old problem of Magic's story! — ironically mirroring its associated sets, which effectively dropped the "Gateless" global plotline in the third act because there simply wasn't enough room in Dragon's Maze for anyone opposing the guilds. The sets were their own issue, suffering from growing pains as Wizards once more explored greater story presence on the cards. 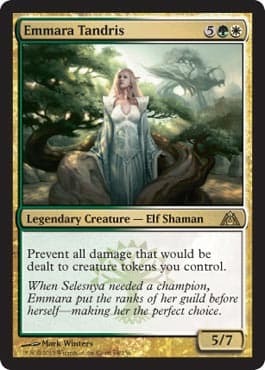 Some pretty goofy decisions, like elvish healer Emmara Tandris showing up on the cards as a nonsensical 5/7 creature, prompted a frustrated response from not just storyline fans but the wider online community, and somehow even the side stories on the cards, like that of Gideon's conflicts with the Boros leadership, didn't jive with the short stories on the website. This mirrored other continuity issues seemingly not resolved by the in-house writing (mainly issues of characterizations not quite lining up). After the one-two punch of the Planehopping Era's radical de-emphasis of storyline/card cohesion, and the collapse of the novel line, the Ebook Era represents Magic's storyline climbing out of a pretty sizable hole. Wizards still had quite a ways to go. When news of the novel line's collapse finally reached us, Brady Dommermuth made it quite clear why there wouldn't, in all likelihood, be much in the way of online fiction for Magic: it simply didn't get read. "Fiction in particular," he noted, "takes more time and focus to produce than a typical staff column, and it doesn't get a higher number of views in line with the additional effort it requires." It also wasn't a high priority at time when Magic was beginning its major expansion into new products: "given the ever-increasing number of card products, marketing efforts, game-like play experiences, digital games/tools, etc., it's tough to justify serving the web-fiction niche." The ebooks helped create that justification. According to Doug Beyer, they helped demonstrate that if the storyline was made more accessible digitally, people would read it, and more players overall would know what was actually going on. But their "just ok" sales numbers also demonstrated that their price point still served as a barrier to entry without necessarily making WotC much of anything in return. Worse, the writing process was somewhat bizarre, with Creative Team members working on the primary vehicle for Magic's story in their spare time. The pressures and incentives tipped just the right way for a new experiment. The story would be told more heavily on the cards once more, and be supplemented by a series of short stories posted on Magic's home page. Khans of Tarkir was the first block to receive this new treatment, and it quickly became the new status quo for the storyline moving forward. Magic Origins was created as a kind of soft reboot to reintroduce players to a team of characters that would represent Magic as a brand, and WotC began actually, astoundingly, to promote the storyline, eventually buying the domain to mtgstory.com and promoting this new central portal for the stories. These stories — originally running in "Uncharted Realms" before finally simply being named "Magic Story" — were all written in-house by different members of the now expanded Creative Team. The storyline of Magic was more accessible than ever before. That's huge. The fanbase for the storyline could grow like never before with this change, as far more people, including less invested players, could easily read the story directly. According to Beyer, in the wake of this change, "readership has exploded." The big gamble that he helped helm paid off, apparently, in a big way. Moreover, the stories could be written without the need to sync everything up to a particular publishing schedule. As with the ebooks, there is a greater flexibility to when edits can be done that simply isn't possible if you're printing and shipping a bunch of physical novels. By the time of Ixalan, that flexibility apparently stretched into authorship as well — that set's stories were credited more broadly to the team as a whole, and Kelly Digges describes a writing process focused on individual scenes, with passages being passed back and forth and revised between him, Alison Luhrs, and Gregg Luben. This process seems to have helped unify the sometimes dissonant authorial voices of some of the earlier Magic Story arcs. All of this seems to have helped revitalize Magic's storyline in a big way. The investment of players in the storyline has allowed the storyline info filled art books to become an apparently successful product, and more resources generally seem to be going to story once more. (The frankly unbelievable deep flavor dives we're seeing on practically every damn card in Dominaria is a testament to this change in priorities!) And the stories have been good. Really good. Not always, granted — there have been ups and downs in each storyline, and overall problems with various arcs, but the highs have been, I would say, perfectly comparable to some of the best of the old novels. It's been so good, in fact, that it's changed my priorities in this column somewhat. I signed on with Gathering Magic assuming I'd be spending most of my time talking about older storyline materials. The stories of Kaladesh and Amonkhet, though, simply gave me so damn much to work with that I've more often found myself racing to keep up with where the storyline goes next. The central problem of each era of in-house Magic Story writing has always, as far as I can see, been one primarily of time. Whether it's “The Secretist” being written in Beyer's "nights and weekends" or Brady Dommermuth suggesting that the Creative Team simply didn't have enough free time to work on short stories, there's always been a sense of crunch. Since Amonkhet, there's been an edge of exhaustion to some of the statements on social media from the Creative Team, and by the end of Ixalan words like "unreasonable" and "not sustainable" were being thrown around. It's easy to see the strain in some parts of the story. Ixalan received a relatively lower number of stories, and the narrative often feels somewhat compressed, with less attention given to fleshing out the four factions than we might otherwise have received. The in-house development also hasn't necessarily resulted in smooth sailing from a continuity perspective. While some elements of the storylines — Nissa "hacking" a god in Amonkhet, for example — might be generously interpreted as red herring plot points, subverted by sudden changes to the narrative, they might be less generously interpreted as simply dropped for convenience or forgotten. Perhaps oddest of all, the story, despite being written after the cards, has increasingly diverged from them in radical ways, and from the plotlines laid out in the Art Books. Which, actually, is a problem unto itself — the Art Books are still beholden to a conventional print publishing schedule and come out before the story is even completed, resulting in a strange, awkward situation where we might learn the end of a narrative weeks before Magic Story gets there, only to discover when we DO get there that actually the final story is considerably different! This era's had its share of rocky moments more broadly as well. The time travel plot of Khans of Tarkir and the soft reboots and retcons of Origins were received with some consternation in older storyline circles. The Gatewatch itself emerged at a time when every movie studio was trying to emulate the success of the Marvel Cinematic Universe and people began to weary of the attempts. They also debuted in a less than well received block, which has always historically been poisonous for flavor and storyline stuff. (See: poor Kamigawa, Ulgrotha, and Mercadia, unfairly denigrated by players unable to separate flavor from tournament viability.) Finally, these characters had to overcome the problems arising from the longstanding story/card segregation. Jace, in particular, suffered from horrible, out of character flavor text which apparently tended to stick in people's memories and get recalled every time his face was used on the now highly Planeswalker-centric promo art. It's absurd at this point to act as though the "Jacetice League" (a pretty good name, but still not as good as "Jace and the Wheeled Warriors" . . . ) hasn't had its fair share of solid stories, but a segment of the fandom seems unready to move on, five or even ten years later. Era 7: Magic Story But With Freelancers. Again. And so we come to this brave new experiment that is actually a lot like a bunch of past brave new experiments. The decision to retain the Magic Story model in place since Khans of Tarkir and supplement it by introducing external, freelance writers who can focus specifically on just writing rather than all the other stuff the Creative Team needs to do has — and I'm sure you'll be shocked to hear this — upsides, and downsides. On the one hand, we're getting twelve story segments for Dominaria. Twelve! And they'll be consistent throughout in terms of authorial voice. On the other hand, we won't get the individual stamp of the pre-Ixalan short stories with their many authors, or the blending of voices we got in Ixalan. Moreover, this does introduce a space for some of the odd problems of the past storyline. Will we see another circumstance, as with “The Purifying Fire”, where sections must be hastily rewritten in-house? Dominaria, I suspect, will be similar to Origins, Time Spiral, Odyssey, and Tempest in that it will exemplify changes behind the scenes. We're already seeing the benefits of some of these changes in the form of the stunning depth of Dominaria's card concepts and a far greater on-card presence of various story elements (including story elements from the very distant past). This is paralleled with a growing awareness at Wizards of the Coast that graphic design itself can be a strong carrier of both mechanical and narrative information. We're also apparently going to see the "Jacetice League" collide with similar heroic teams of Planeswalkers from the past . . . or their legacies. It's all very comic book. Will this finally be enough to win over the people who apparently hate these (decade old) "new" characters? We'll see. Nothing about the future of the Novel Line is guaranteed, though, and there's no straightforward fail-proof path to success, either in terms of profits or in terms of literary merit. As Brady noted back in 2012, "Please know that across the 66 published Magic novels, we have tried every combination of more/less creative control, more/less time, and more/less money. No combination of those elements guarantees a great novel." History bears this out. And yet, there are high points in all the eras of Magic's story, and often even at its most uneven Magic is still fascinatingly experimental. That might be the most remarkable thing of all: that so much of what Magic does, no one else has ever attempted before, yet nevertheless Magic manages to often do it really well. Here's to another 25 years of upsides, downsides, experimentation, and perpetual change.